Lavapiés is very trendy in the city right now, with new places opening every now and then that welcome a different view of this old and traditional “barrio”, like art galleries, restaurants, refurbished buildings, coffee shops, and all kinds of stores. 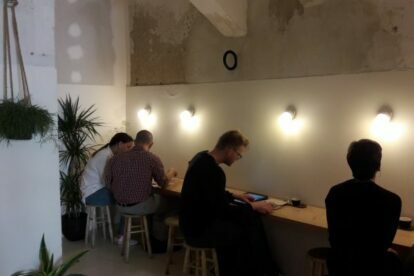 Hola Coffee is one of them so I had to check it out for myself, and this is what I found out: white spaces, strong wifi signal and friendly staff; soft music always playing; cool walls, wooden tables and planks and plants that make for the best picture frames. All of that in a dog-friendly environment. One of the things that I really enjoyed about this coffee shop is how they do not seem to settle for what is trendy right now. Instead, they offer traditional coffee and even roast their own beans. They do not offer decaf; soy, lactose free, fat free or oat milk are not available. Just regular cow milk or almond milk if that is your choice. I mean, what is there not lo love? Another cool thing? Hola Coffee offers different types of workshops on the subject. Whether you want to learn how to make it properly or you want to learn the different types of coffee roasts, of maybe even if you are more interested in a coffee tasting, they have something for you. For professionals, a certified course by the Specialty Coffee Association of Europe is also available. Their knowledge is amazing and the shop is a perfect place for coffee lovers.